Nevada County gardens vary widely. Elevations range from 1,000 to 4,000 feet. Soil types are red clay, serpentine, sandy loam, forest loam or something in-between. Generally acidic, soils may lack necessary nutrients and organic matter. Some gardens are below the snowline, while others are often covered with snow and may have frozen soil for an extended time. 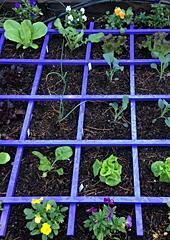 We know that “One size does not fit all.” Gardening in Nevada County is unlike gardening elsewhere and it is not the same throughout the county. Master Gardeners are here to provide home gardeners in Nevada County with science-based information, whatever their gardening conditions. 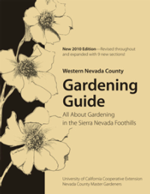 The Western Nevada County Gardening Guide is written by our Master Gardeners to provide gardening information specifically for our county. Click here for more information. Come visit the Demonstration Garden at 1036 W. Main, Grass Valley, on the NID grounds. If you would like to schedule a group tour led by a Master Gardener, please call our Hotline office. Busy, busy! Fall in the Demonstration Garden started with an explosion of activity. First there was the Tomato Tasting, which drew an enthusiastic crowd. 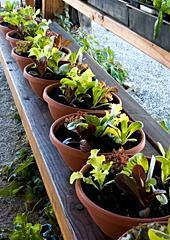 Our Fall Plant Sale was the following weekend, bringing another steady stream of visitors. This year we grew and offered many vegetable plants for a winter garden, along with an assortment of drought-tolerant perennials and native plants. Our Demo Garden looked lovely, due to several clean-up days where Master Gardeners tidied extensively. Right after the plant sale, the Propagation Team started cuttings and divisions to grow plants for the Spring Plant Sale. New stepping stones have appeared in the Cottage Garden with hints of surprises to come. 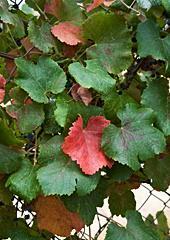 In the container gardens, pumpkins were harvested and new plantings appeared. This included edible landscaping, combining vegetables, flowers and a decorative element.